The main benefactor from our concerts is Breast Cancer Now. Professor Uwe Vinkemeier is studying a group of proteins called STAT proteins. Up to now, the role of STAT proteins in breast cancer has not been clear, but the recent findings by Professor Vinkemeier suggest a new way that STAT proteins might work. Professor Vinkemeier has recently discovered a new way that STAT proteins might enhance their function by forming clusters called ‘paracrystals’. For example, he has found evidence that STAT1 might stop STAT3 paracrystals forming, which might explain how STAT1 can sometimes protect against breast cancer. With his Breast Cancer Campaign pilot grant of £19,710, Professor Vinkemeier intends to study the importance of STAT paracrystals in breast cancer by looking for them in tumour samples from the Breast Cancer Campaign Tissue Bank. He will also investigate the role of STAT1 paracrystals by producing different versions of STAT1 that either always or never forms these paracrystals in breast cancer cells, and measuring how this affects how the cells multiply and survive. Scientists need to continue to pursue new avenues in breast cancer research so that new treatments can be developed for the future and hopefully find a cure for breast cancer. In this ground-breaking pilot project, Professor Vinkemeier hopes to find out whether STAT paracrystals are important in breast cancer. If they do, this could lead to new ways to diagnose breast cancer, as well as new drugs with which to fight the disease. Our first research project which was undertaken at the University of Leicester where Dr Julian Barwell researched the effects of radiotherapy on the hearts of breast cancer patients. We 'adopted' the whole project and are delighted to inform you that we have already made the final payment for this and are now contributing to a second project, also taking place at the University of Leicester. 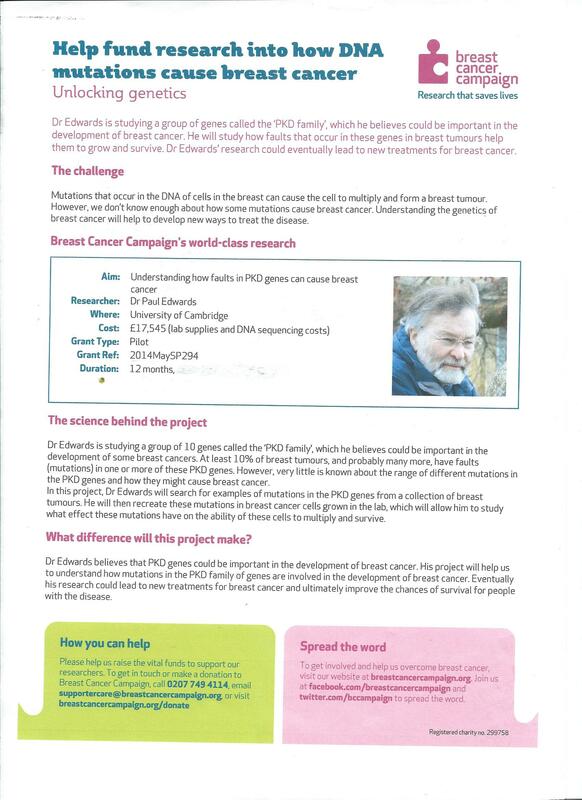 In this project, Dr Tulchinsky will be investigating two molecules called ZEB1 and SIP1 which they believe are essential to cells developing the ability to spread and he will study whether these molecules are involved in breast cancer metastasis and define the role they play. When DNA gets damaged our cells can grow out of control, becoming cancerous. In healthy cells this DNA damage is normally repaired by certain genes and proteins but some people have a mutation in these genes or proteins so their DNA can accumulate damage faster, making them more likely to develop cancer. One of the proteins that helps to repair DNA damage is called SMUG1. Dr Madhusudan has previously found that SMUG1 is absent in about a quarter of breast tumours. Since breast cancer cells that lack SMUG1 cannot repair DNA damage effectively, he believes that chemotherapy and radiotherapy treatments (which work by damaging DNA in cancer cells so that they die) might be particularly effective against these breast cancers. 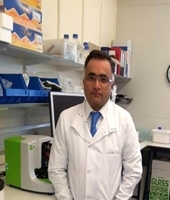 With his Breast Cancer Campaign pilot grant of £15,000, Dr Madhusudan working at the University of Nottingham, aims to find out whether a lack of SMUG1 means that certain chemotherapy drugs work better in these patients, using tissue samples and breast cancer cells grown in the laboratory. Dr Madhusudan believes that in the long term a lack of SMUG1 could be used to identify patients who would particularly benefit from certain breast cancer treatments. This will enable patients to be treated with the most suitable drugs tailored for their breast cancer, leading to a better chance of survival and improved quality of life.